Residential to commercial, emergency and preventative, you trust us to do it all! Sewers: The main line connecting your property to the city. 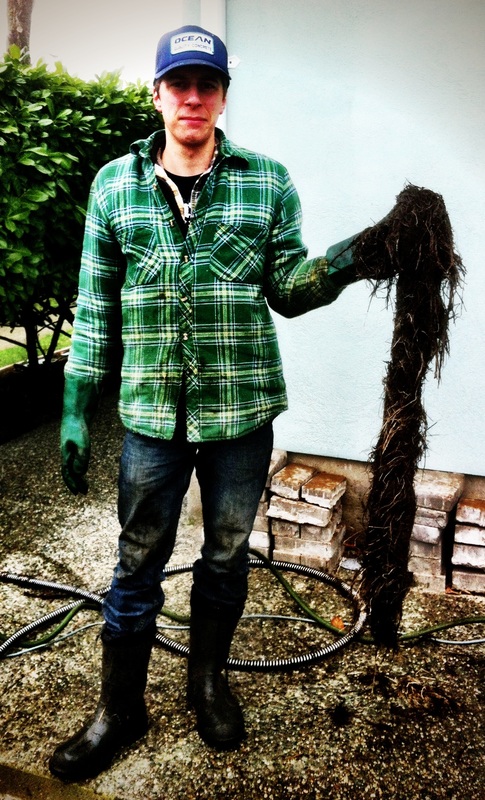 Blair with roots pulled from a sewer. The #1 cause of a plugged sewer is from tree roots finding their way into the line. Using a blade tipped cable spinning at 700 rpm we can cut through and remove these problematic roots. Depending on the density of roots in the system we may recommend scheduling regular yearly or bi-yearly cleanings in order to prevent a sewer back up into your property. Remember, tree roots in your sewer doesn’t require you to spend thousands of dollars to have your property dug up and the line replaced. Trees are strong and relentless, and they may still find a way in to the easy water source. Hair and products can build an unrelenting “hair sausage”. Using either a soft nose small cable, or blade tipped, we can return the tub to it’s original draining condition. In an apartment building, the kitchen sink lines can be placed in stacks and vented to the roof. Because of this, kitchen sink lines can sometimes be augered from the roof. Access is also usually needed to the suite above and below to ensure they are running fine. If a sink in the basement is clogged the cause maybe from a sink line directly above that is problematic. The #1 cause of a plugged toilet is from flushing foreign objects down. If your basement toilet is backing up into the basement shower or tub it is possible the main sewer line is plugged. To prevent flooding, we advise not using any water in the property until it is serviced. Drain tiles collect all the rainwater from the roof of a property and usually connect to a sump or rock pit. We can service red clay drain tiles only if they are connected to a sump and not into a rock pit or french drain. Usually the only remedy to a clogged rock pit or french drain is to dig it up. 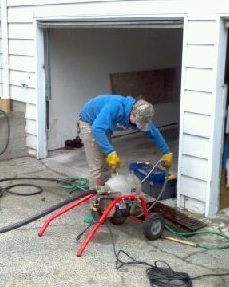 The Murph augering a driveway drain. These are similar to drain tiles. 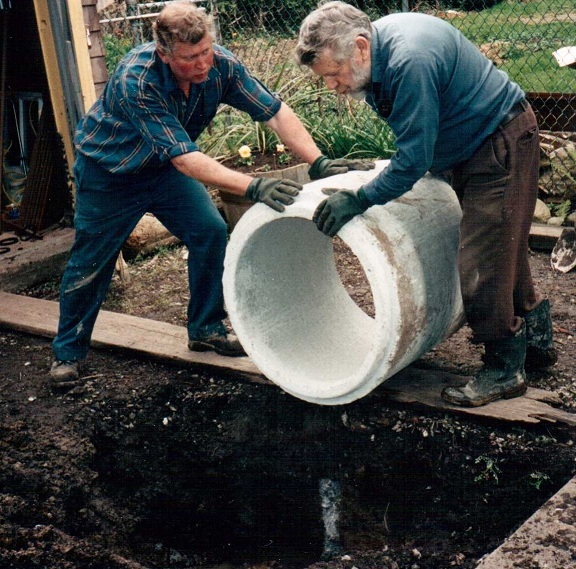 Andy and Al installing a sump. Usually located in the basement of a property or outside with a concrete lid. We can clean out the air vents on an apartment building as a preventative measure for your tenants.